SLICE IT RIGHT EVERY TIME! A good chef's knife becomes your daily kitchen companion. It's used for everything from prepping steaks for the grill to finely mincing onions, and chances are you'll reach for it every time you cook--so it better be good. 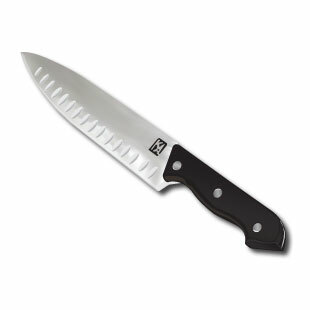 This lower-priced line from Henckels is a great value: excellent quality knives with their standard lifetime warranty. There's good balance that will ease your job by not stressing your hands. The handles are a shade heavier than other lines, which some cooks will prefer. The 8-inch blade length is the most practical for multipurpose use, and regular sharpening will keep the stainless-steel blade razor-sharp. When it comes to slicing and dicing, this chef's knife saves you time.